There’s plenty you can do to help your child get ready for their first day at primary school. Here are some top tips for things you can do in the run-up to their first day at school, so all they’ll have to concentrate on is learning something new and enjoying themselves with their new friends. Remembering the staff – you probably will have met the teacher and some of the staff in your child’s class at a home-visit or settling-in session. Reminding your child about their names and how nice they are can be helpful. Practising what to say in key situations, such as: ‘Good morning, Mrs Cook’ or ‘Please may I go to the toilet?’ will give children confidence. Practising the routine – it can be helpful to do a practice journey before the big day, looking for interesting things on the way. It might also be a good idea to make sure your child has school-friendly bedtimes and getting-up times a few days before their first day. Reading books – there are lots of wonderful children’s books about starting school that can help to answer children’s questions and explain how the school day works. We've pulled together a list of our favourite books to read before starting school here. Recognising their name – it’s handy if your child can find their space in the cloakroom (although their peg might have a picture on it too) and their clothes and belongings. Labelling their clothes will help both your child and school staff to keep track of their belongings: iron on labels or a name written on the label in permanent marker work perfectly well. Don’t forget to label bags, hats, scarfs, gloves and shoes. If it can be taken off and lost, label it. Going to the loo on their own – being able to use the loo and wash their hands afterwards will help your child to feel independent. If they are having fun at school, children may leave going to the loo to the last possible moment, so reminding them to pay attention to when they need to go can reduce the chances of an accident. Putting their coat and shoes on – the ‘changeable’ British weather means that children will take their coat on and off endlessly in the first term of school. The quicker they are, the more time they’ll have for learning and play. Distinguishing between left and right shoes can be tricky, so try drawing two halves of a smiley face in their shoes to make a complete smiley face when the shoes are placed together correctly. Dressing – being able to dress and undress independently will help your child when it comes to changing in and out of their PE kit. When choosing shoes (velcro!) and clothes (easily washable! ), try to make sure that they are easy to take off and put back on. School staff will help with fiddly zips or buttons but the more your child can do on their own, the more independent they’ll be. Eating – whether having a school or a packed lunch, helping your child prepare for lunchtime is very beneficial. Useful lunchtime skills include: being able to use a knife and fork, opening their own lunchbox and being able to open everything in their lunchbox – some yoghurt tubes and drink cartons can be quite tricky so do check at home beforehand. Not all children develop at the same pace. If your child can’t do all these things perfectly before they start school, don’t panic, as they will get there in the end with your help and encouragement. Do let the school staff know about any concerns and that way they’ll be ready to help. We've created a checklist to stick on your fridge to help you prepare for the big day. 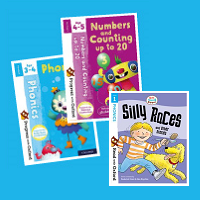 From our much-loved Biff, Chip and Kipper stories to curriculum-levelled activity books, these books and flashcards will help you support your child's reading and maths skills at home.